All of them have surprised themselves with what they can do on a bike. If you fancy finding out for yourself, we'd love you to join us. The rides are all led by accredited ride leaders and we do not leave anyone behind. If you get into difficulties we will split the ride - but that's a rare occurrence. We made it to Winchester, now we just have to get back again! You need to have a bike and sufficient confidence to ride on roads in a group. If you are concerned that you do not have a suitable bike. or the right type of clothing, see below. Although the challenge involves cathedrals, the events are not religious. All faiths and none are welcome. Our oldest rider last year was 84 and our youngest was 11. Our insurance requires that riders under 16 are accompanied by a responsible adult. Riders aged 17 or 18 must have a parental consent form signed by a parent or guardian for every ride. If you suffer a medical condition that might limit your ability to ride, please consult your doctor before joining the ride. Please also advise us of your condition before joining a ride so we can take it into account in our planning. Please note we cannot undertake that anyone on the ride will have first aid or medical expertise. We start on 8th April 2018, the week-end after Easter. The challenge rides will finish at the end of June. You can join as many rides as you like. What is the programme of events? The challenge rides will take place once a week alternating between Sundays and Saturdays. You're welcome to do both, or mix and match to suit your availability. You can also join any of our other organised rides you fancy. Sunday 8th April and Saturday 14th April: short 'get to know you' rides. They will introduce you to group riding and will include a free bike check. Sunday 22nd and Saturday 28th April: the Bronze challenge, a ride from Havant to Portsmouth Cathedral and back. This is a flat, leisurely ride mostly on cycle paths or cycle lanes. 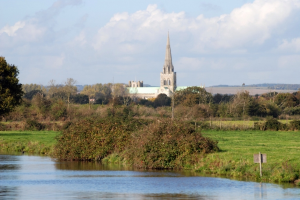 Sunday 20th and Saturday 26th May: the Silver challenge, a ride through the South Downs National Park to Chichester Cathedral and back. We'll mostly be using country lanes and there will be some undulation, enough to get some scenic views, but nothing dramatic. Saturday 23rd June: the Gold challenge, a ride to Winchester Cathedral and back. Do I have to go on every ride? No. It's entirely up to you which rides you decide to join. We've designed the programme to help you build distance over time, however, so we encourage you to follow the programme if you can. Do I have to cycle to the start? No. All the rides are circular and will return to their start point (although some riders will leave the ride as we get close to the end if they live near the route). All the starts are near a car park, railway station and bus route (for those with folding bikes). As the rides progress we hope you'll want to cycle to the start, but it's entirely up to you. We also plan to have a support vehicle available to the initial rides to provide a 'take me home' or 'take me to a station' service in the unlikely event it's needed. What if I can't make Saturdays or Sundays? We are flexible. Let us know if you have a problem with the programme and we might be able to help. For example, we might be able to put on additional rides during the week if there is a demand for them. In particular, we will try to accommodate any rider that can't make the final Gold ride on 23rd June. First of all, we hope you'll enjoy yourself. On our doorstep we have some of the best cycling in the country. We hope you'll enjoy discovering it from a new perspective in good company. Cycling offers a unique - and low cost - opportunity to face a series of challenges that might look impossible at the outset, but are, in fact, achievable. If you're retired or coming up to retirement, it's rare to find new challenges - but cycling might be one of them. Even if you don't achieve all the challenges within the programme you'll have plenty of other opportunities to continue cycling and meet the challenges later on. However you achieve them, you'll find considerable satisfaction in meeting the challenges that cycling - and the Cathedral Challenge - has to offer. Then there are the health benefits. There's a great deal of information on the web about the health benefits of cycling. Just Google "cycling health benefits" to see plenty of articles. Finally, we'll present you with a certificate of achievement listing all the challenges you met! What will Portsmouth CTC get out of it? Cycling is a terrific opportunity to challenge people of all ages to achieve something they never thought possible. That's incredibly satisfying for us. That's it. We don't benefit financially and the club is healthy - we'd love you to join our rides, but we're not desperate for new members. You are more at risk doing an hour's gardening or DIY, than you are spending an hour on your bike. Compared mile for mile, the risk of a cyclist being killed is virtually the same as that of a pedestrian. Cycling UK calculates the general risk of any injury from cycling in Great Britain to be around 1 per 20,000 miles. The risk of death while cycling in Great Britain is 1 in 27.7 million miles. Put that way, the risks associated with cycling are significantly lower than those of driving a car. And it's enjoyable too. We hope that, if you take up the Cathedral Challenge, you'll find that cycling is great way to get around and meet people. I don't like the sound of hills! The first few challenge rides are flat, but it's inevitable we will face hills as the challenge progresses. And then there's the psychology. The more you believe you can do a hill, the easier it becomes. That's a little circular, but the more hill-climbing you do you'll find that not only will you get stronger, but your self-belief will get stronger too. You can find out more about tackling hills here. Finally, our rides are meant to be enjoyable. There's a thrill of overcoming the challenge of a hill. But, if you're struggling, there's absolutely no shame in getting off and pushing. We've all done it. The group will wait for you at the top (although, it's not unusual for people pushing to beat some cyclists to the top). What will it cost? do I need to be a Cycling UK member? There's no cost to join any of our rides. They are all led by volunteers. Portsmouth CTC benefits from insurance cover negotiated by the Cycling UK charity. However, that requires us to ask you to join Cycling UK after you have tried three rides with us. We hope you'll agree the cost of membership is good value for a series of well-led and supported rides including a free bike check and free cycling advice. Standard, annual membership costs between £21.50 (for students) to £45. There are concessions for unemployed and older cyclists. There are also reductions for family membership, longer-term subscriptions, disabled riders and carers. You can find out more about Cycling UK membership here. 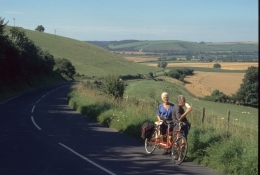 Cycling UK members also have access to the members' area of our web site. Although it doesn't cost anything to join a ride, we usually take time out for a 'coffee stop'. That's how we earned our nickname "Coffee, Tea and Cake". So you'll want to bring some cash to join in. The longer, Gold rides will also stop for lunch. You'll have a choice of eating a packed lunch or getting something to eat from a shop, pub or café. Do I need to collect sponsorships? We've no problem, though, if you want to give yourself a little more incentive to complete the challenges by getting yourself sponsored. We'll document the challenges you met with a certificate of achievement so you can collect from your sponsors. Your bike must be safe to ride on the road. We reserve the right to refuse you entry if there's a serious problem with your bike. Having said that, it's likely there'll be a bunch of people trying to help you fix the problem. We don't place any restrictions on the type of bike you ride and you'll be able to complete the first few rides on just about any bike. As the rides get more challenging, you'll feel the effect if your bike needs maintenance or is inappropriate for the type of riding we do. For example, a few of our riders use suspension bikes, but the large majority use much lighter bikes designed for riding on roads. We're happy to discuss types of bike with you at any time, but be aware that there's a huge variety of bikes available (arguably more types of bike than there are types of car) and if you ask three cyclists you can get four opinions! Please don't, however, go out and buy a bike without getting some good advice. If you don't know what you're looking for there's a real danger you'll waste a lot of money. Also, don't be tempted to give up on a bike just because you find it uncomfortable to start with. Switching from straight handlebars to drop handlebars, for example, can be very uncomfortable for the first few rides (as resale of virtually new bikes on eBay testifies). We can help you find a suitable position on the bike, but perseverance might be necessary. If you know your bike has problems - or you suspect it might be unsafe or unsuitable, please get in touch well before joining the ride. We'll try to arrange to check it out and give you some help to get it ready for the first ride. There's some more guidance here. Do I need to wear cycle clothing? a helmet? No. There's no requirement to wear any special cycle clothing. However, comfort on your bike is arguably more important than fitness or stamina when it comes to completing a cycle challenge. We discuss clothing for a ride - including helmets - here. What if I can't do the distance? It's worth saying this is rarely a problem, even for new riders. We'll be starting with short, easy rides but you will be surprised how quickly the miles roll past when you're cycling. But, seriously, distance is rarely an issue for new riders. Honest. We'll slow down, or split the ride to allow faster and slower riders to proceed at their own pace. We will not leave you behind. Depending on how many riders there are at the start, we might split into multiple groups. We provide some suggestions here. You will be riding with experienced riders that will have a range of tools with them, just in case. We can also help you with simple mechanical issues like puncture repairs. Note, however, that punctures can destroy inner tubes so you cannot rely on being able to repair a puncture. Experienced riders will have spare tubes with them, but we cannot guarantee to have a replacement tube for your bike - you should therefore invest in at least one spare inner tube for your tyres (we can advise which type you need). "I came way with a huge sense of achievement. I started casual cycling 2 years ago, aged over 60 and am amazed that I have cycled not only my first 100k but also a hilly one." "As a newcomer to the area the Cathedral challenge was a great chance to meet people and to ride in a safe and supportive environment"
"Free cycle training with tea and cake!" "The rides felt really well organised, friendly and supportive"
"I would never have thought I could do it (cycle that far... get up that hill... )"
"The Cathedral challenge rides helped me improve my cycling technique, increase my distance and meet some great people. They are well planned, well run and a great way to see the local country side." "Exploring country lanes with like minded people and stopping for tea and cakes, what's not to enjoy?" We hope that's encouraged you to take up our Cathedral Challenge. If you need more information, please get in touch with the organisers. Otherwise, please register with us using the form below. There's no commitment on your part, but registration will give us a better idea of numbers and we will be able to contact you if there's a change of plans. Please enter your details to register for the Cathedral Challenge. We promise to use your information only in connection with the challenge. We will not pass it on to anyone else, nor will we pester you with emails. To register more than one person, please submit separate registrations for each one.